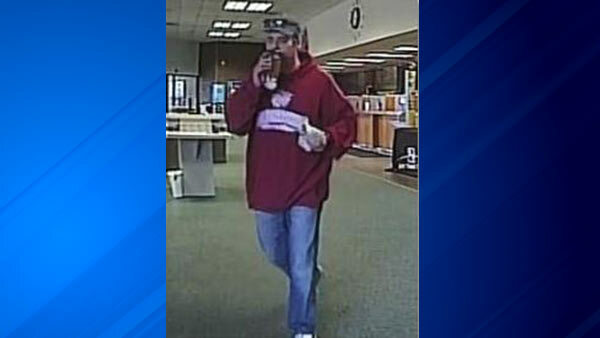 CRYSTAL LAKE, Ill. (WLS) -- A man robbed a bank in northwest suburban Crystal Lake on Monday afternoon, police said. Authorities said the suspect took an undetermined amount of cash from the Fifth Third Bank in the 200-block of W. Virginia Street around 4:15 p.m. Monday. Police released surveillance images of the male suspect. He's described as approximately 37 years old, with brown hair and facial stubble. Police said he was wearing a dark grey baseball cap with sunglasses on the visor, a red pullover hooded sweatshirts with a white logo, blue jeans, and white and blue Nike shoes. Crystal Lake police and the FBI are continuing to investigate. Anyone with information is asked to contact the Crystal Lake Police Dept. at 815-346-3620.